I spent a day in Seattle with my cousin Kate, enroute to a visit with granddaughter. Since my daughter moved from Seattle quite a few years ago, I only get to visit Seattle perhaps once or maybe twice a year. I have a number of places that I love to return to and am always exploring new additions. This recent visit was a day of sheer bliss. 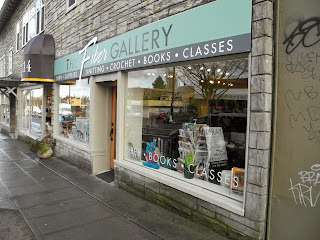 Our first stop was a new store for me, Threadneedle Street, in Issaquah, WA. I have been gingerly entering the world of hand stitching for the past six months. With really limited time, it has been a slow process but I am finally picking up speed. I really wanted to learn if there were any resources in Seattle that might be useful to me. Well, Threadneedle is now on my list of 'must visits'. I didn't take any photos while I was in the store as I was too busy just absorbing what was there and speaking with the owner. As I began to look for a photo of the store to include here, I actually found a really great review of the store, complete with photos. 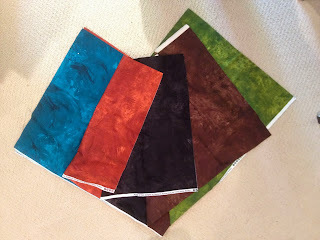 So, I suggest you visit Mary Corbet's Need'n Thread website to learn about the place. She does a far better explanation of what is there than I could at this point. I can assure you that it is a very friendly, comprehensive source of materials for needlework with a great online store as well. From Issaquah, we traveled into the Pike Place Market area in Seattle so I could visit Undercover Quilts. 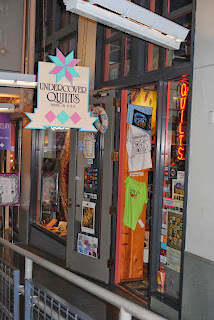 This is a place I have written about many times and simply have to visit if I am in Seattle. The owner, Linda Hitchcock, has become a friend over the years. She has the same taste in fabrics that I do. It is amazing.....I walk into the store, begin browsing, and I will uncannily pick out some of the newest bolts that she has added. This time I bought some of a great series entitled Plaster of Paris by Stephanie Brandenburg for Frond Design Studios that Linda found at the Houston marketplace. From Undercover Quilts, my cousin and I moved on to the Seattle Art Museum where we discovered the admission was free since it was the first Thursday of the month! After a delicious lunch in their restaurant, Taste, which is always excellent, we spent some time touring the museum. There is nothing quite a uplifting as walking through a museum. It gets your mind off the turmoil outside in the world! I saw some wonderful aboriginal art and some beautiful asian embroidery. It is great that the museum is constantly adding in new works throughout their exhibits - surprises abound even if you have been through the museum many times. Next on our marathon day, we visited The Fiber Gallery over in the Greenwood area of Seattle. They have a wonderful selection of yarns. What I love about the store is that samples hang with free instructions near different yarns. For an intermediate level knitter like myself, it is easy to browse, be inspired and instantly know how you might use a yarn, how difficult a pattern might be, and how much you would need. The store is spacious, offers off-street parking, and is very friendly. As you can tell, it is a place I make a real effort to return to on my Seattle visits. Finally, we finished off our day with a trip to University Village. This mall has grown by leaps and bounds over the years. When my daughter was a student at Seattle University, it was basically a small outdoor mall in the shape of a cross with a few outlying stores. Now it is a maze of stores with actual parking structures. We stopped in a new place for a quick snack - Evolution Fresh. What an amazing treat! We chose an apple/ginger drink and sampled some vegetable drink options. All tasted FRESH beyond belief. The store is part of a national chain and I would encourage you to try it if one is located near you.